Dadasaheb Phalke’s Raja Harishchandra (1913) had triggered off great enthusiasm among many aspiring filmmakers. Among them was a young man, Baburao Painter. 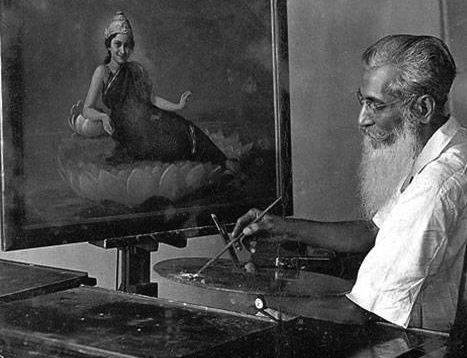 Painter was born Baburao Krishnarao Mestri on June 3rd, 1890 in Kolhapur. He taught himself to paint (hence the name) and sculpt in the academic art school style. He and his artist cousin, Anandrao Painter, were the leading painters of stage backdrops between 1910 and 1916 in Western India doing several famous curtains for Sangeet Natak troupes and also for Gujarati Parsi theatres. They became avid filmgoers following Raja Harishchandra. They turned to cinema first as exhibitors while trying to assemble their own camera. Anadrao, however, died in 1916 and Painter and his main disciple, VG Damle, eventually put together a working camera in 1918. With financial support from local nobility, Painter set up the Maharashtra Film Company in Kolhapur in 1919. Painter gathered around him old colleagues among them Damle and S Fatehlal joined a little later by V Shantaram – the group that later left to set up The Prabhat Film Company. He also introduced two female artisits Gulab Bai and Anusuya Bai renamed as Kamala Devi and Sushila Devi respectively. Since acting was looked down upon, the two ladies were excommunicated by their community and had to find refuge in the studio premises. As well as acting in films, they would often cook and serve food to the entire unit! Baburao’s first film, Sairandhri (1920), attracted the attention of the then censor board for its graphic depiction of the slaying of Keechaka by Bhima. Finally it had to be deleted but the film won both critical and commercial acclaim spurring Painter on to more ambitious projects. Baburao was a man of many talents – he wrote his own screenplays, changed the concept of set designing from painted curtains to solid multi-dimensional lived in spaces, he introduced artificial lighting and understood the importance of publicity. As early as 1921-22 he was the first to issue programme booklets, complete with details of the film and its photographs. He also painted himself tasteful, eye-catching posters of all his films. Sinhagad (1923) proved to be one of his most popular films. In fact, it attracted the Revenue Department’s attention to bring about introduction of Entertainment Tax! Not so successful was what is regarded as the first realistic Indian film, Savkari Pash (1925), dealing with money lending, a problem that blighted the lives of countless illiterate, poor farmers. Sadly for Baburao, the audience long fed on mythological fantasy and historical love was just not prepared for so strong a dose of realism. Baburao thereafter returned to costume dramas. Netaji Palkar (1927) directed by V Shantaram and Karna (1928) directed by Damle and Fatehlal were huge hits for Baburao’s Maharshtra Film Company. However, after a few more silent films, the company pulled down its shutters with the advent of sound. Baburao was not particularly keen on the talkies for he believed that they would destroy the visual culture so painfully evolved over the years. He returned to painting and sculpture, his original vocation. Painter returned to filmmaking for sporadic ventures like remaking Savkari Pash in sound in 1936, Pratibha(1937), a bi-lingual in Hindi and Marathi, which nicely show Painter’s control over big sets, lighting and crowd scenes and Lokshahir Ramjoshi/Matwala Shayar Ramjoshi (1947), specially on Shantaram’s invitation. Painter died on January 16, 1954.